If you’re curious to see what the perfect kids’ desk looks like, then take a gander at this utterly covetable room furnishing from the clever folks at Loaf in London. 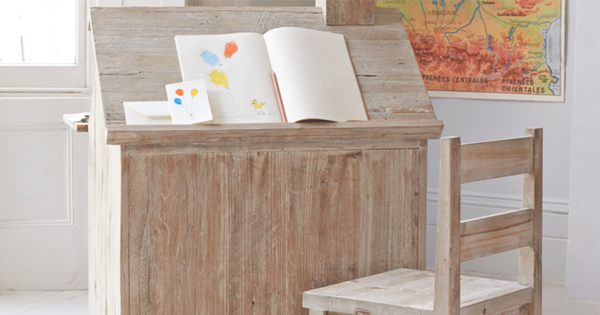 Part cubby, part desk, part easel it’s the ultimate kids creativity nook. Space is often at a premium in our modern homes, so this clever combination pulls its weight by being both cute cubby and stylish workstation. If there’s one way to appeal to kid’s creative natures, it’s by giving them a beautiful place where they want to sit, create and play. 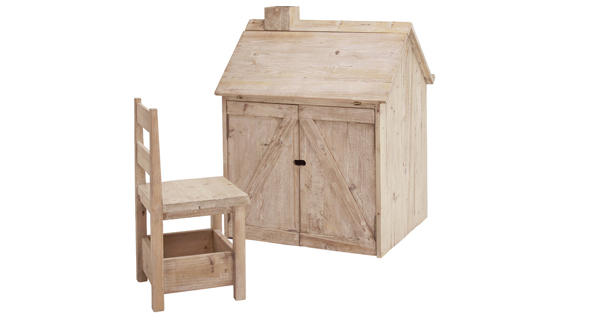 This beautifully designed piece of furniture has all the looks that appeal to kids without compromising any of the functionality. One side of the roof folds down and rests on the open doors to create the desk, the other side is an easel with lip on the lower edge. The nifty storage features, like an inbuilt cupboard with a removable shelf, make organising the kid’s books and supplies super simple. Even the chimney is hard at work being a moveable pen pot. The Roofus is certainly a step (or five) above your average kids’ desk. The easel on the back is perfect for a spot of painting or as a rest for sheet music when it’s time for music practice. You can easily imagine the Roofus becoming a part of your kid’s childhood, as they throw a sheet over the top when they’re little and snuggle into the den filled with imagination and cushions. When they’re bigger they’ll be pulling up the lovely little chair with built-in book tray, to sit at the desk and finish up some art or homework. Both the chair and desk are made from solid reclaimed fir wood, recovered from old buildings, giving it that natural authentic charm. Its neutral tones mean the Roofus is one investment that’s going to last and evolve with kid’s changing needs, never outgrowing their tastes. Currently only available in the UK for £495 from Loaf, you will need to organise a reshipper to deliver to Australia.